They said it would be easy! Just head out to the desert and a legendary flying machine is just waiting for you. All you have to do is explore a few ancient ruins and you’ll be golden. They didn’t tell you about the deadly windstorms, the blistering heat, and the giant piles of sand that you’d have to trudge through. Also, do you have enough water on hand to survive? Well, hopefully you brought some clever teammates along for the ride, because you’re going the need to cooperate to win when you’re playing Forbidden Desert! 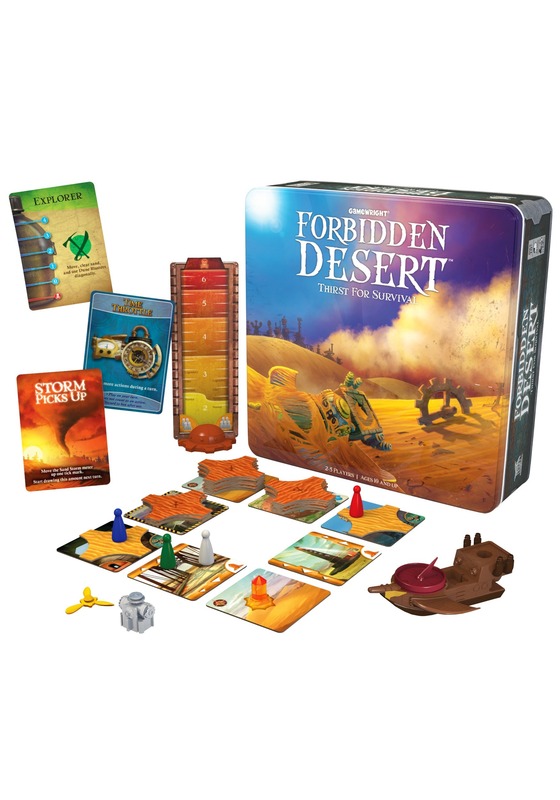 Forbidden Desert is the sequel to the popular game, Forbidden Island. It pits 2 to 5 players against the elements of the desert. Your goal is to find a legendary flying machine while staving off the harsh desert climate. You’ll need to solve puzzles together, navigate the shifting sands, and keep an eye on your resources as you trek your way to victory! The game itself comes with game cards, sand markers, terrain tiles, and game pieces. It takes around 45 minutes to play once everyone is familiar with the rules and it encourages cooperation between all players. If you played Forbidden Island, this game might be your next journey! With advanced mechanics, it’s the perfect step up from the original game. If you’re just looking for a different cooperative game to play, then gather up your team and get ready for a trip to the desert!